Creating Sacred Space with Sacred Art: Yoga, Meditation, Healing, Om Symbol, Reiki and Lotus Art. Meditation, the timeless practice of listening to the divine, is expressed in these meditation art pieces. Using the ancient symbols of the labyrinth and the flower of life, a journey into the flowering possibilities of life is begun. These pieces can be used as tools to assist us as we listen to the hidden wisdom of the cosmos. The Yoga art pieces at Om Village are the perfect gift for Yoga enthusiasts! Inspired by yoga poses and combined with the mehndi style of art from ancient India, you'll love the power and peace these yoga art pieces will bring into your sacred space. Reiki is a Japanese word meaning "universal life energy", a healing art that uses divine energy to heal on physical, emotional and spiritual levels. Weaved in with the oriental brush painting style, the Reiki art pieces can be used to radiate healing energy and to decorate your home or office space. The meditative Om symbol art pieces and art products at Om Village are designed as a complement to your meditation practice. 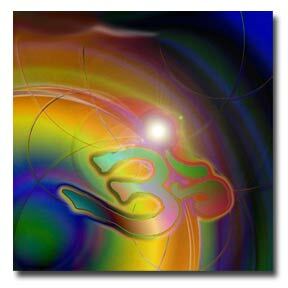 Om Art of this kind, envisioned as healing art, can be used not only as a beautiful piece for a home or work space, but also as a doorway into our innermost being. Combining auric colors with sacred geometry and the heart language of the Om Symbol, we hope to bring you a lifelong treasure of art. Exquisite set of five greeting cards in a beautifully designed lotus petal paper box. Send your blessings and good wishes with these hand fashioned, richly textured and colored greeting cards.